This project goes WAY beyond millinery. In this class, you will learn to make lovely wire edge faux enamel flowers and leaves. These can be used for hat decoration, floral arrangements, adornments on costumes and lots more. The easy to learn process is presented in not only dozens of still photos, you will also have access to a video showing you the steps. The supplies are easy to find, and the technique is quite addictive once you get the hang of it. 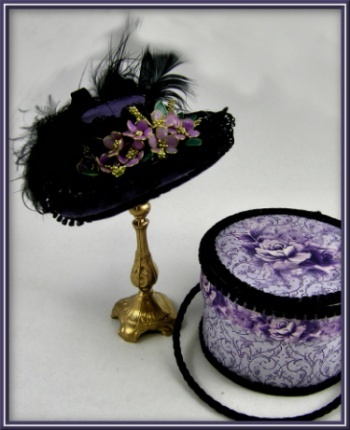 Our beautiful flowers and leaves were placed on a flat crowned purple hat trimmed with black french laces and feathers. The result is a stunningly beautiful design. A coordinating hatbox is also included.